Great Britain's David Smith was outplayed in an absorbing BC1 individual final, losing 7-0 to Thailand's Pattaya Tadtong. Smith opened up several promising positions, but Tadtong's power and precision prevented him converting them into a serious challenge. After Smith had slipped 3-0 down by the halfway point, the difference doubled in the third end. And Smith, unable to stage a comeback, had to settle for silver. 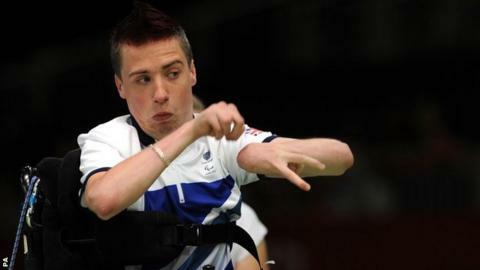 "What meant more to me was not the medal, but my own performance and showing the world that I am a great Boccia player. I think I proved that," Smith told BBC Sport. "On the day he was able to get down the court a bit easier and his blasting was awesome. "I couldn't quite match that because I am a little bit more restricted than he is. "The way he throws is very smooth and fluid. It is rare for a BC1 to have that so he takes full advantage of that and fair play to him." Captain Nigel Murray had backed Smith to take revenge in the individual event, but it proved beyond him as Tadtong consistently found the shots to control the area around the jack. After sealing the final six-throw end 1-0 to complete a shut-out of Smith on the scoreboard and collect his second gold of the Games, Tadtong celebrated out of his chair on the court to a deserved standing ovation from a packed ExCeL. In the BC4 bronze final earlier in the day, Smith's compatriot Stephen McGuire was also well beaten as Brazil's Eliseu dos Santos wrapped up the final spot on the podium with a 5-3 win. It was the second fourth-place finish for McGuire who, together with brother Peter, lost 8-2 to Canada in the BC4 pairs bronze-medal match. McGuire, who won world championship silver in 2010, lost the second of the four six-throw ends 4-0 to slip 5-0 adrift at the halfway point. He registered on the scoreboard for the first time by winning the third 1-0, but, despite throwing the jack deep to the back of the court to create a long-range finale, he fell just short of an unlikely comeback.